MOBILE MOVIES CELEBRATING EASTER The musical movie ‘The Easter Parade’ was shown at the Wednesday Club and joined in their 18 year celebrations. 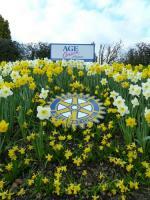 Spring is in the air and the Rotary flower bed is in fully bloom. Promoting excellence of service for Polmont Age Concern Thanks to Polmont Horticultural Society for planting the display. Visit to the Falkirk Homeless Project in Laurieston. 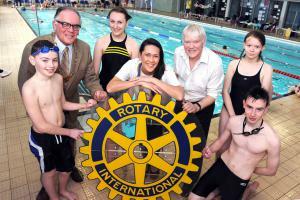 Members of the Community Committee to experience hands on the good work that is performed by this local charity. Fun, fellowship and sunshine in Edinburgh Fringe Festival. Good fun had by all! Congratulations to the new Rotarians at Edinburgh Park. Wishing you every success.